May 14, 2015 at 2:30 pm EDT | by Lou Chibbaro Jr. 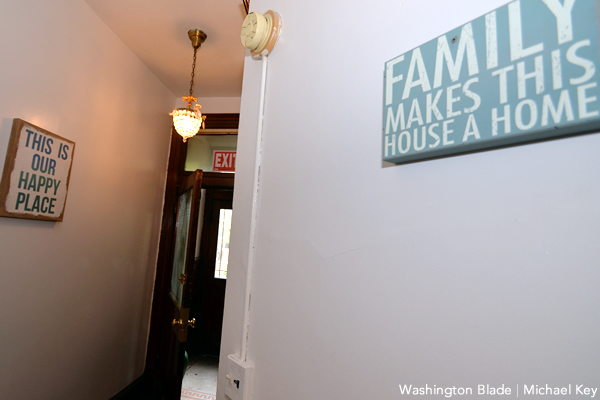 The first five residents of the Casa Ruby house for homeless LGBT youth were scheduled to move into the three-story Victorian townhouse in the city’s Columbia Heights neighborhood this weekend, according to Casa Ruby founder and executive director Ruby Corado. Seven more residents were expected to move in within the next few weeks, she said. They will be cared for by a support team consisting of paid staff members and volunteers, including house monitors who will be on site in three shifts 24 hours a day, seven days a week, Corado said while taking a Blade reporter and photographer on a tour of the house. “We will provide food,” she said. “We have volunteers that are actually going to help with nutrition. We have a clinical team which is making sure they don’t only have a place to live but they also are supported emotionally and psychologically,” Corado explained in referring to the LGBT residents. “We have a team of about 30 people that are supporting the house,” she said. Corado said among those moving in this weekend are two transgender residents, two gay male teenagers, and a 21-year-old lesbian. 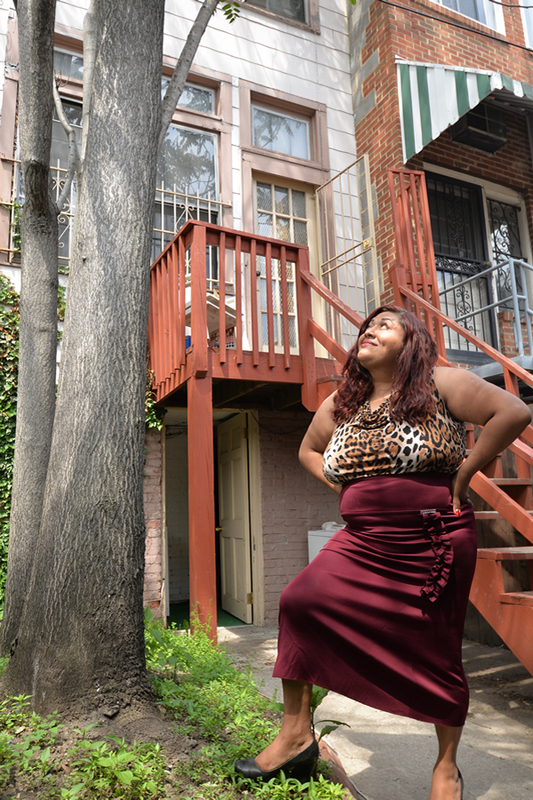 As part of a project that’s been in the works for nearly two years, Corado said a D.C. government grant will pay the rent for the sprawling house with 2,799 square feet of living space plus a mostly finished basement. City property records show that the house, which was built in 1910, had 8 bedrooms and five bathrooms, with a total of 14 rooms. In preparing the house, Casa Ruby officials have used a few of the bedrooms for other purposes, including meeting space. The furnishings, including 12 brand new single frame and bunk beds, living room furniture, desks, and office furnishings for the staff, have been paid for by private donations, Corado said. In a storage area on one of the floors there are multiple racks of clothes of all types – all appearing new or in perfect condition. 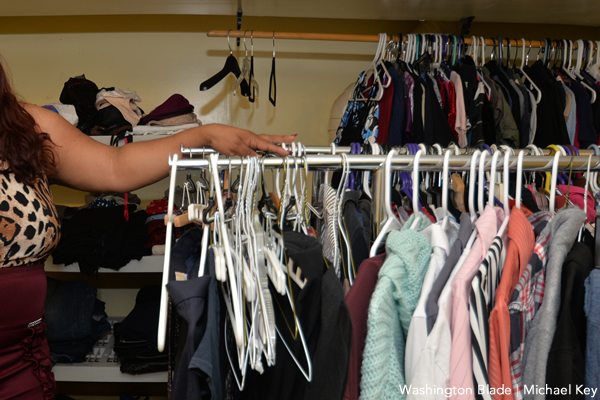 “We want to make sure they have access to things they need because they’re homeless,” said Corado. “They don’t have any income. Their parents threw them out. Sometimes the system just can’t deal with them and they come here,” she said. The dark wood trim around the home’s Victorian style windows and doors has been offset by bright decorative wall hangings, including a large clock hanging on the wall in the entrance foyer above where a staff member will be sitting at a desk. “We have a gay touch to the house,” Corado said. “There’s lots of color. 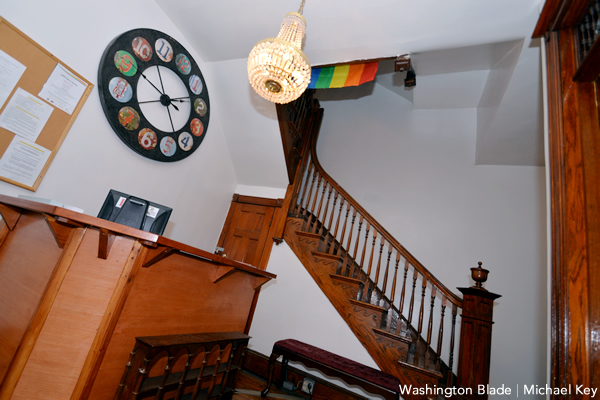 The gay flag, the chandeliers – it’s a beautiful home and it’s very gay. 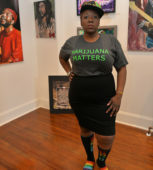 That’s what makes this a very unique space,” she says. The house is located on the 1100 block of Columbia Rd., N.W., less than four blocks from the Casa Ruby LGBT community center and social services facility at 2822 Georgia Ave., N.W. According to Corado, the link between Casa Ruby and the new home on Columbia Road will provide something that most homeless shelters or longer-term residential facilities for the homeless do not provide – a series of programs to help the residents get on their feet and become self-sufficient, possibly within a period of six months or less. Oh, if only this could have been available to me when I was homeless! But I’m happy for the people who will be moving in. Good work, everyone! Thank you, Ruby Corado & your team. You are saving lives. I wish blessings for you and your house. The world is a brighter place because of you. Congratulations Ruby! Hope this house is as successful as Casa Ruby is right now..
…thank you for this article, Lou! I’m proud to be a part of the Casa Ruby movement and hope that this piece encourages many more to support the house! As Ruby said, it truly is a community taking care of people! Hope to see everyone at Casa Ruby’s 3rd year anniversary reception on June 2nd, at the PEPCO Gallery in Chinatown!! Can I donate clothes, time or money? I’m in DC. Thanks Lou for covering this topic. As a member of the SMYAL team, we appreciate the efforts made to shed light on homeless LGBT youth. Great work Ruby.